SSI Aeration offers replacement membranes that will fit the bodies of most competitor’s diffusers both disc and tube. Replacement membranes are available in SSI’s patented PTFE, EPDM, and Silicone. Whether it is a ceramic-to-membrane or a membrane-to-membrane retrofit, SSI can help. Our replacement diffuser membranes are produced in house with the same high quality materials and production methods as our standard line. Our membranes have been field tested in municipal and industrial applications worldwide with excellent results in high oxygen transfer efficiency, optimal performance for longer lifespan, and reduced power costs. 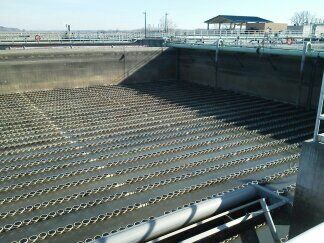 Replacement of ceramic-to-membrane retrofit membranes at North Texas Metro Water District, Wilson Creek WWTP in Allen, Texas in 2009. SSI Supplied over 40,000 PTFE coated membranes with backer-plates to replace the current ceramic diffusers. Replacement of membranes at Kruger Wayagamack, Trois Rivers QC. SSI supplied over 27,000 PTFE coated membranes in 2008-2011. 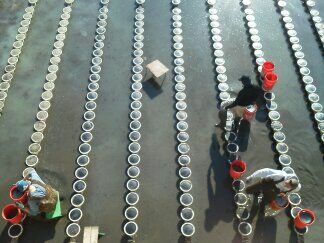 Replacement of Piece County Utilities membranes in Tacoma, Washington. SSI Supplied 9,000 PTFE coated membranes in 2009.